That kid is one great talent. Recently arrived in Barcelona and already working for the national museum of art. Quite a success, I’d say..
Frédéric Eyl and Sigrídur Kristín Sæmundsdóttir created the christmas installation for the prestigious MNAC (Museu Nacional d’Art de Catalunya), which he has documented here in a very nice way. 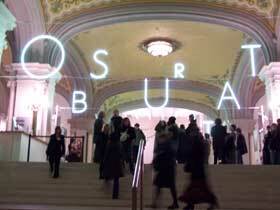 A short description: ” illuminated neon-letters are spread all over several layers in the entry-hall space. viewed from one perspective they form the word OBSCURITAT (darkness) playing on the essential contradictional concepts of light and darkness important especially in wintertime. “. And again he made it to We make money not art..